Along with other impressive gymnasts in Rio this year, Aly Raisman manages to show off a number of different skills when she performs a floor routine, especially when you consider she's only given a 40 foot by 40 foot floor to do so. The gymnast is particularly well-known for her execution of an Arabian double front, and the way she seamlessly blends it with the rest of her routine — but what exactly is an Arabian in gymnastics? It is a skill to which many gymnasts aspire, especially because of how much it can help their scores in competition. An Arabian is a type of somersault that starts out with a backward entry into a half twist that begins immediately after takeoff, and then continues into a front flip. In a double Arabian — a move that Raisman has apparently perfected — the half twist is followed by two consecutive front flips. What defines an Arabian, and differentiates it from other back flips, is the timing of the half twist. If the half twist does not happen immediately after the gymnast takes off from the floor, the move becomes a back flip with a half twist, and cannot be called an Arabian. 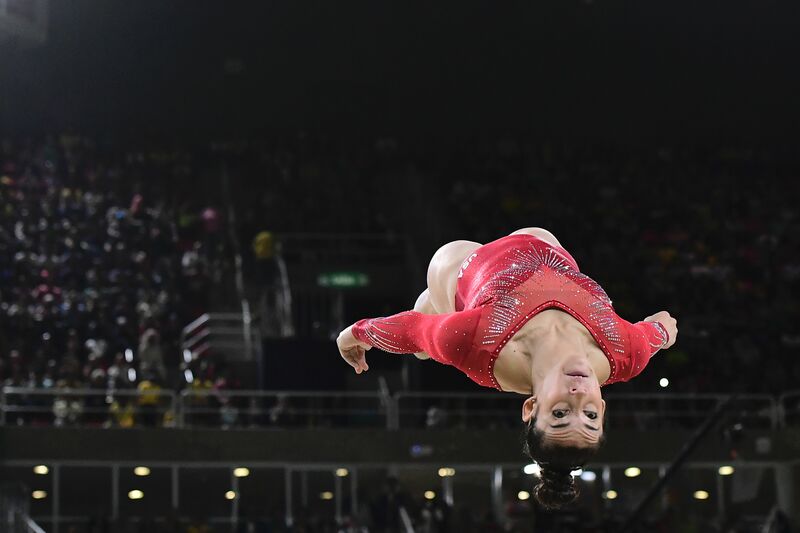 Raisman doesn't just pull off Arabians in her floor routine — she has also performed a tucked Arabian double front dismount during her beam routines, a move dubbed "the Patterson" for 2004 Olympic all-around champion Carly Patterson. In the video below, you can see Patterson start off a beam routine with an Arabian. She then concludes the routine with the now-famous Patterson dismount. Patterson and Raisman are not the only Olympic gymnasts known for incorporating Arabians into their beam and floor routines. Gymnasts like Viktoria Komova of Russia and the United States' Chellsie Memmel and Terin Humphrey have successfully executed variations of the Arabian into their beam routines too. On the floor, meanwhile, Russia's Aliya Mustafina and Poland's Marta Pihan-Kulesza, among others, have successfully included Arabians in their routines. Patterson is also not the only gymnast to have an Arabian-based move named after her. Brazil's Daiane dos Santos actually has two skills named after her. The Dos Santos I is a piked double Arabian, and the Dos Santos II is a laid-out double Arabian. Dos Santos is retired now, but she competed at the Summer Olympics in 2004, 2008, and 2012. Given how successful gymnasts like Patterson, Raisman, and Dos Santos have been, it should be no surprise that so many gymnasts are trying to incorporate the Arabian into their Olympic routines.